The Center City District and Central Philadelphia Development Corporation have been working since 1999 to improve the Benjamin Franklin Parkway. In 1999 CPDC released a plan for high-density development on the Parkway that prompted interest, as well as opposition to the elimination of so much open space. In 2004, CPDC released a second, less-dense, public space oriented improvement plan that has guided all CCD’s investments since then including: new directional and interpretive signage, pedestrian and architectural lighting, the renovation of Aviator Park in front of the Franklin Institute, the redesign of Three Parkway Plaza at 16th and the Parkway as the location for Café Cret and the redesign of Sister Cities Park into a family-friendly destination at 18th and the Parkway. CCD took on the long-term management and programming of Sister Cities Park and the park surrounding Café Cret, but not of Aviator Park. The goal of all these projects has been to transform the Parkway into an animated, pedestrian-friendly cultural campus. The 100th anniversary of the Parkway is an excellent opportunity to consider once again the type of appropriate development and landscape improvements that could animate the Parkway in the same way that so much of Center City has been activated in the last 25 years. Below are two videos produced by History Making Productions about the future of the Parkway. The first is a short 12-minute movie that tells the history of the Parkway, highlights its strengths and weaknesses and challenges Philadelphia once again to think boldly about the future of the Parkway. As part of this effort, landscape designer Laurie Olin presented some concepts (not plans) that suggest how the Parkway could accommodate more cultural institutions, high-quality gardens and new residential housing. The second is Laurie Olin presenting his concepts for the Parkway's future at the December 2017 Central Philadelphia Development Corporation membership meeting. 1911 plan for a more densely developed Parkway. To view 12-minute movie about the history of the Parkway, its current challenges and opportunities, click here. 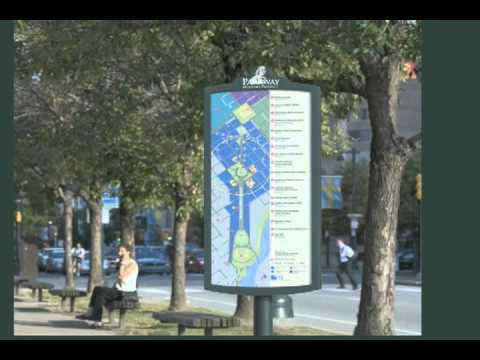 Directional and interpretive signs installed by CCD in 2007 guide pedestrians along the Benjamin Franklin Parkway and provide information about the institutions, public sculpture and the planning and development of the historic boulevard. Cloud Gehshan Associates designed the signs for CCD, along with Dommert Phillips, who together worked with Parkway stakeholders and the Association for Public Art (aPA) to determine themes for interpretation, iconography and content. The project was funded with support from the William Penn Foundation. Completed in 2008, this re-landscaped plaza is home to Capriccio Café. The café contains an information kiosk to assist visitors in locating area sites, events and attractions. The café, designed by Cope Linder Architects, serves coffee and light fare in both indoor and outdoor settings seven days a week. Revenues generated by the café serve as a source of funding for ongoing maintenance of Cret Park and other park land and streetscape improvements made by the Center City District along the Parkway. Other improvements to the plaza include new sidewalks, lawn, trees, shrubs and flowers and new benches and lighting. Design and construction of the plaza improvements were funded by the Pennsylvania Department of Conservation and Natural Resources, the Pennsylvania Department of Transportation, the City of Philadelphia’s Parks & Recreation Department and AGL Investments. For more information on the park, please visit cretpark.org. Aviator Park, located on the Parkway adjacent to The Franklin Institute and Moore College of Art + Design, is now an open, green, family-friendly oasis after extensive reconstruction by the CCD in 2007. The park has new paved walkways, plantings, benches, trash receptacles and light fixtures. Aviator Park's redesign and reconstruction was funded with federal transportation enhancement dollars through the Commonwealth of Pennsylvania (PennDOT) with the Fairmount Park Commission serving as CCD's project partner. The design team consisted of Lager Raabe Skafte Landscape Architects, Urban Engineers, Inc., and Pennoni Associates as construction inspectors. The CCD does not currently maintain this park. In 2012, the Center City District cut the ribbon on a renovated Sister Cities Park, located at Logan Square immediately in front of the Basilica of Saints Peter and Paul. The public park includes a pavilion housing a café and visitor center, outdoor Children’s Discovery Garden and play area, boat pond and interactive fountain that pays tribute to Philadelphia’s 11 global sister cities. The pavilion incorporates contemporary green building systems including geothermal technologies and a green roof. New trees, water features, walkways and lighting improved the park’s landscape, providing attractive amenities for all users. The renovation of Sister Cities Park was accomplished in partnership with the Philadelphia Department of Parks & Recreation, with funding from The Pew Charitable Trusts, the Pennsylvania Department of Community and Economic Development, the state Redevelopment Assistance Capital Program, and the Pennsylvania Department of Transportation. The award-winning design team includes DIGSAU architects, Pennoni Engineers, Inc. and Studio|Bryan Hanes, landscape architect. For more information on the park, please visit sistercitiespark.org. The CCD installed 222 ornamental, pedestrian-scale lights along the Parkway's sidewalks and another 132 vehicular lights along the Parkway from 16th Street up to and including Eakin's Oval. Installation began in August 2003 and was completed in June 2004, and was funded by The Pew Charitable Trusts and the Commonwealth of Pennsylvania. As part of its ongoing work to transform the Benjamin Franklin Parkway into a pedestrian-friendly, animated cultural campus for Philadelphia, CCD has bathed the Parkway in light. Since 2004, CCD has illuminated the façades of eight landmark buildings and 20 monumental works of public art along the Parkway. In addition, CCD installed 222 pedestrian-scale lights and 132 roadway lights. To learn more, visit the Lighting page. CCD enhanced pedestrian access to the historic Swann Fountain at Logan Square and to adjacent cultural institutions with the 2004 installation of six, new signalized crosswalks. The William Penn Foundation-funded project also adjusted the geometry of the square to make it safer and easier for vehicles to navigate.